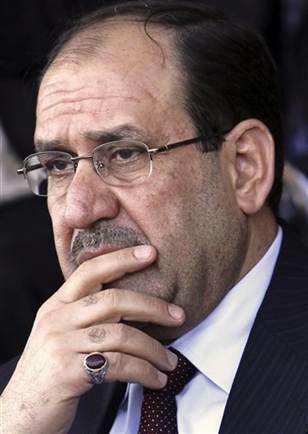 Iraqi Prime Minister Nouri al-Maliki, seen in January 2009, narrowly held on to a second four-year term last year. BAGHDAD — Prime Minister Nouri al-Maliki will not run for a third term in 2014, an adviser said Saturday, limiting himself in the name of democracy and with an eye on the popular anger directed at governments across the Middle East. Al-Maliki narrowly held on to a second four-year term after his political bloc fell two seats short of its main rival in national elections last year. He will step down at a fragile time in Iraq's history — his successor will be the first Iraqi leader to run the nation without U.S. military help since Saddam Hussein. Al-Maliki adviser Ali al-Moussawi said the premier also wants to change the Iraqi constitution before he leaves to limit all future prime ministers to two terms. "Eight years is enough for him, in order to not convert to a dictatorship," al-Moussawi told The Associated Press, as state TV announced al-Maliki's decision. "This is the principle and the concept of democracy." Saturday's stunning announcement follows al-Maliki's decision a day earlier to return half of his annual salary to the government — a move he said aimed to narrow the wide gap between rich and poor Iraqis. Al-Maliki is not required to publicly report his pay, but he is believed to earn at least $360,000 annually. The salary cut appeared calculated to insulate al-Maliki from the anti-government unrest spreading across the Middle East, as clerics and protesters warned him not to ignore public bitterness over Iraq's sagging economy and electricity shortages. The U.S. government estimates that as many as 30 percent of Iraqis are unemployed. Al-Maliki's decision to announce he will step down after two terms — a deadline more than three years away — appeared fueled by the same desire to shield Iraq from uprisings in Egypt and Tunisia. But it is particularly surprising, given his drawn-out fight last year to keep his job after his party failed to win the most seats in parliamentary elections last March. Do Egypt protests make al-Qaida 'irrelevant'? Al-Maliki, a Shiite, remained prime minister only after pulling enough support from allies in closed-door negations and promising to share power with his rival Sunni-based political alliance. Updated 12 minutes ago 2/9/2011 12:25:18 PM +00:00 Egypt's protesters and opposition groups were infuriated by a warning from the new vice president that if their movement doesn't enter negotiations, a "coup" could take place. U.S., Israel trust Egypt's VP, but do Egyptians? Are the protests in Egypt quieting down?